Revisiting an urban oasis to check on nature — and our role in it. I LIKE TRYING to photograph time, and Union Bay beckons. Dynamic changes can happen here in 10,000 years and in 1/1000th of a second. What is 10 years in the life of a landscape, I have been wondering. It has been about that long since I first explored the bay to create a self-published book and a cover story for this magazine. My desire then was to contribute even a little more awareness about this precious urban oasis while decisions were being made about the next looming impact on its future: a replacement 520 floating bridge. I was hoping the welfare of the bay and all of its life would be a priority. Now the first concrete is dry. 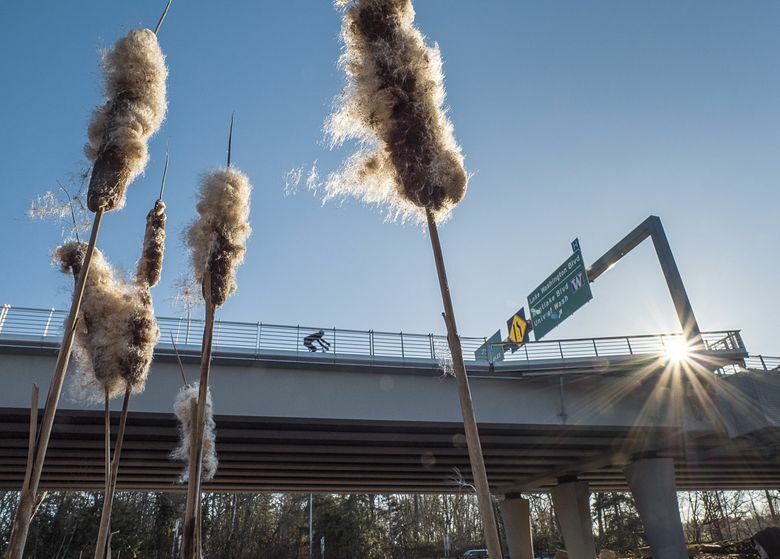 The opening of the trail for walkers and bike riders on the finished portion of the new bridge has drawn me back, offering a chance to see and wonder from fresh viewpoints. To those who have been caring, keeping watch and sharing experiences all this while, warm thanks. THE FULL STORY: How much of a burden can we be to Union Bay before the strain is too much? Fortunately, the bay still seems compelling in many of its old, familiar ways. But concerns for its future are familiar, too. Though I am lucky to live nearby, this fragile gem is also within easy reach of growing millions who populate this metropolitan area, for better or worse. Maybe each of us will choose to be a steward. Ten years ago I had a few questions: How much have we separated ourselves from the rest of the natural world? Do we get to select which parts of nature we want to keep and which we can do without? Let’s go have a good look at Union Bay, and ask our human selves once more. Tom Reese is an independent photographer, editor and teacher; author of “Once and Future River: Reclaiming the Duwamish”; and a former staff photographer for The Seattle Times.